I find it strange to be posting photos tinged with damp grey, while the light outside is cascading in through my bedroom windows. Nevertheless, the golden tone sprinked over today does match the spring-like feeling of these images, which make up the second part of my bee-inspired behind the camera shoot. I saw Shona again the other day, and enquired as to whether she might be interested in modelling again for me sometime. Her response? "Only if it's warmer". I can second that, especially when I remember how much my fingers resembled ice blocks by the time we had finished. I pondered for a while about another bee related title, and after discarding the notion of calling it 'Flight of the seven million bumblebees' in homage to Black Books (a fantastic British comedy - if you love Dylan Moran, make it a priority to watch), I settled on something a little more literary inspired. I really enjoyed Sue Monk Kidd's book 'The Secret Life of Bees', and now own a wonderfully battered copy that was given to me by Jill. This, along with an iD Beekeeper inspired shoot that I have just remembered, makes this a post that is black and yellow and striped all over. I guess it's one of those slightly cliched things, but I think there is something a little romantic about the idea of having a beehive or two in an orchard - alongside some meandering chickens and a vegetable plot. A typical rural idyll I guess - doesn't really relate to my life in the countryside much. We do have a small allotment, but the only thing it is growing at the moment is weeds. However, my mum and I were talking to a good friend yesterday, who said that although bee numbers are meant to be dwindling, he has had a ridiculously large surge in his swarms - to the point that he has had to donate a swarm to a neighbour. Very hopeful! Now, to one lone (and rather elegantly dressed) bumblebee - Shona. In the first few photos, she is wearing an underskirt from a charity shop, layered over her own black leotard and my yellow tights. The little gold shrug used to live in my dressing up box, and the gold shoes are from ebay. The necklace and belt are both from charity shops. One again, I enlisted Shona's very handy ballet skills for the photos. The second ensemble was created from a customised dress (it used to be a floaty skirt, that I then cut 'arm holes' into), a woolly vintage scarf and a Laura Ashley charity shopped striped hat. The belt was given to me, the shoes were from ebay and the jewellery is vintage. Oh & the gloves are another remnant left over from my dressing up box - because everyone needs a pair of sparkly gold evening gloves. The third is a yellow poloneck from a charity shop, along with a vintage necklace and the same gloves. Now, I'm sure the ginger cat pictured is the closest I'll find to the 'Cheshire Cat' from Alice in Wonderland. Either he craves human attention, or is publicity hungry - as he methodically followed Shona and I all over the sprawling arboretum that I'd chosen as our location. Sometimes it was a case of running to one spot, quickly snapping some photos before the cat could catch up, and then moving on. Well Cheshire Cat, if you wanted some internet exposure, then here you go. My first GCSE exam is tomorrow, so from now on the blog might be a little less active. Hopefully all the revision will pay off, and come the middle of June, I can start living again - although maybe with a few days for rest and recuperation first. I am looking forward to finishing highschool and heading off in the next phase of my education to a dynamic sixthform. I love your photography posts, I think my favourite has to be the last, it looks justlike it's been taken from a film! And as always the outfits are impeccable! Good luck in your exams, I'm not looking forward to trekking through the mass of exams I have waiting either, but I'm sure you'll do well! she is so beautiful and looks so tall! i can see why you love photographing her! Such beautiful pictures, the focus on that last one is perfect! Also, I am a massive Dylan Moran/Black Books fan!! Good luck in your exams! Good luck with your GCSEs! At my school it's all a bit crazy, with our teachers all telling us that we have to understand the pressure the year 11's are under. Frankly I'm just happy I've not got my maths test back yet because our Maths teacher is so preoccupied marking year 11 revision! Love the colours in this outfit, and the fantastic tights. Terrific photos. I love your blog. And the Shona "avec cat" photo is perfect! Love your style....I better start following you. what beautiful photos. i especially love the first shot - there is such a mystery to it, and the styling is perfect! best of luck on your exams! My favourite item here is the hat - great find! Thanks for both of your comments Roz - I guessed the first "anonymous" one was you when you referenced visiting Montmartre as a perfect alternative to revision - I wish it was possible! Agree about the newspaper dress - any chance you can remember when you wrote your post on it so I can see your interpretation? Best of luck with tomorrow's exam - I trust you'll be absolutely fine. I know it's the only way possible, but having gcses in Summer is cruel! Anyway, just focus on the lovely summer you can have without the stress of revision! Hi again Roz, just read your "Paper Doll" post from last year (I typed your blog address and 'Newspaper Dress' into google - the wonders of technology!) and I commend you for even attempting the feat of creating a newspaper dress! Yours looks great, I especially love the touch of the bow made out of the blue and white striped carrier bag! That Vogue shoot looks fantastic - the pink and white paper bag jacket with pockets is ingenious! It was the same thing about Gary Harvey that interested me - his use of mundane, everyday objects that get thrown away when they are still perfectly useful. Who knows, we might still see something that resembles this on the catwalk before the years out?! oh wow these pictures are really good :)! i love looking at your photograpy posts! that cat picture is like the best picture I've ever seen! I love it! I love these photos, especially the last one which is amazing. Love the colour of your tights too, they add a great pop without being too bright. beautiful skirt, and i love the tights paired with the shawl! Beautiful photos! and good luck on your exams! oooh what cute photos, i love the first one! I was just looking at your blog and thinking how wonderful this photoshoot is, when surprise, I saw your comment on mine! Funny how the world works! The second outfit is amazing, I'm feeling quite inspired and have to restrain myself from going to cut arm holes in all of my long skirts! Oh, and I am very excited to hear the good news about the bees. I can't wait for the day when I have masses of space and can keep bees myself. Best of luck on the GCSEs! You look just great ;)! Simply the best pictures I have seen all day. Great writing too. First: best of luck for your exams. You'll rock them and don't worry about the blog. Secondly, I do love the picture with the cat, it is perfection in itself. One can't plan stuff like that. LOVE IT. I also like the first and the third picture. Though I'm generally no fan of yellow tights. Yellow is a difficult colour to wear, at least for me. Again, BEST OF LUCK FOR THOSE GCSEs!!! Love how you used the underskirt, it looks amazing! I absolutely adored that book! Good luck with your exams, for your English if you write half as brilliantly as you write on here then you'll get an A*! Thanks for commenting on my blog! 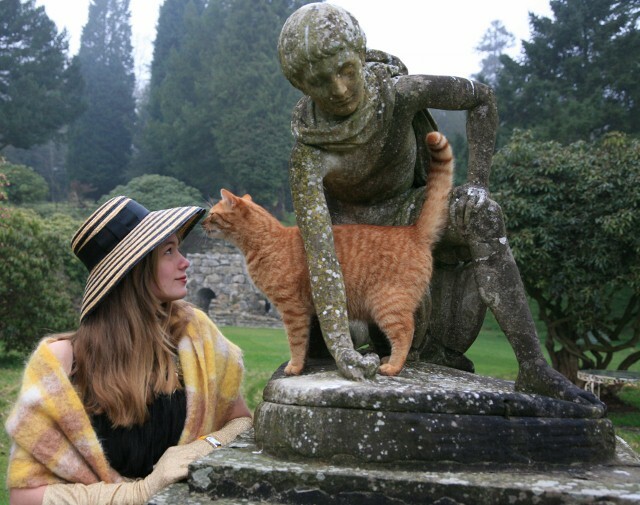 Oh I love that cat photograph, and I adore that hat. I've been searching for a similar one with to no avail. Good luck with your GCSE's - mine start soon too, sadly. I love the one with the cat. These photos are gorgeous. how cute are you! great photos! Love your style and good luck on your exams! That tiered, black skirt in the first photo is gorgeous! Love the whole setting too. I just posted more dance photos on mine and am working on the product of our ballet photo shoot. We dance next week! RE: "I love the idea that everyone wearing ballet style pumps this summer could suddenly, simultaneously break into dance. Wouldn't it be a great moment?" HELL YES! Ha ha, your comment made me chuckle, thank you. There is a lovely ballet theme going on in the first two photos here, I can see :). Where is this? It looks so lovely, and I can just half imagine how gorgeous it would look when all the flowers come out into bloom. Good luck in your exam. These photos are incredible, I especially love the one with you and the cat. So cute! Good luck with your GCSEs! greattttttttt post and blog here! I hope your revision went well and that you'll be back to blogging in no time! Wonderful photos...it's like a Vogue photoshoot!! Well done!! The shoot reminds me of The Secret Garden and Alice in Wonderland. Dreamy!